Get ready for the holidays in the fun and festive Let's Get Lit Dog Hoodie by fabdog® - Blue! 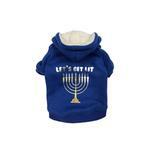 The fun and cozy Let's Get Lit Dog Hoodie by fabdog® - Blue is perfect as a gift for Hanukkah. It features a nine-branch menorah with the words "Lets Get Lit" screen printed on the back. The dog hoodie is 100% cotton and has a soft sherpa lined hood. Its convenient leash hole makes for easy in and out during all the holiday excitment! It is machine washable, lay flat to dry. Celebrate Hanukkah in style this year and every year with the fun Let's Get Lit Dog Hoodie by fabdog® - Blue! Size 8: Length 7-9", Chest 10", Neck 6-8"
Size 10: Length 9-11", Chest 13", Neck 7-9"
Size 12: Length 11-13", Chest 16", Neck 8-10"
Size 14: Length 13-15", Chest 18", Neck 9-12"
Size 16: Length 15-17", Chest 20", Neck 11-13"
Size 18: Length 17-19", Chest 22", Neck 12-13"
Size 24: Length 23-25", Chest 24", Neck 15-20"